Orange-chins Girley Bird, in the foreground, and Pickles were hatched in April, 2007. Girley is bold, curious, affectionate, and very tame. Pickles on the other hand, is a little on the timid side. He follows her everywhere. They not only wolf whistle, but they also whistle tunes. They have both been talking since they were 4 months old. Their vocabulary includes "What are you doin, come here, pretty bird and here kitty, kitty, kitty." They love birdie bread and apples. Girley likes to perch on my glasses and Pickles on my head. They are fun and perfect in every way. In the summer time they travel in their carrier to our beach cottage where there is a cage set up for them. Girley and Pickles reside with Betty and Howard in Point Pleasant, NJ. 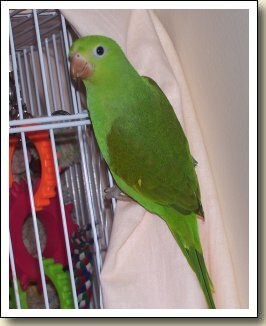 Manu, a male Canary-wing, hatched 4/1/2007 and is just a bundle of energy. He is an eating, playing, pooping machine. So much fun!!! He is just the cutest little guy. He is talking. "Good boy, how are you, yummy, yummy, hi baby" and some unintelligible utterings. When he knows he is in trouble the "good boy" comes into play. He is very quiet from the time he puts himself to bed until he is uncovered in the morning. From that time on he is in motion non-stop. He is not, at this time, saying his name but I hope some day he will. I throughly enjoy him much to the displeasure of my macaw Dusty. It is a joy to see how much this little bird loves life. Manu lives in Danville, CA with Shelley & Dusty. 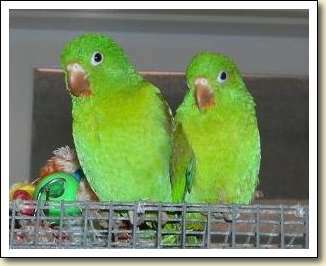 Niles and Piper are Orange-chinned parakeets from two different clutches. Both hatched in Spring 2006 with slight defects. 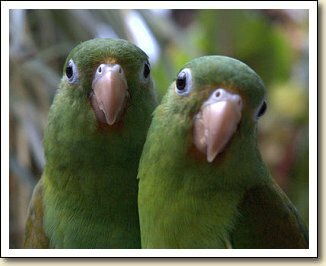 Niles (male) has a deformed upper & lower beak; Piper (female) has a clenched right foot and a slightly bulging right eye. Although Piper is 2 months older than Niles, she is 50% smaller and weighs a mere 41 grams. This "odd couple" are cagemates who do everything together. Piper even rides along in Niles' carrier when he goes to the vet for his beak trims, providing moral support. They are both good whistlers and Niles talks quite a bit. Their favorite fruits are mango and blueberries. They live in San Diego, CA in a household with 12 other Brotos. 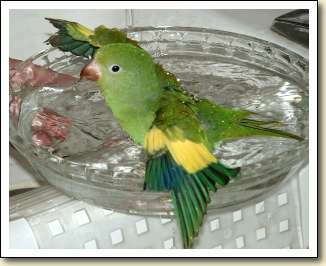 Harry is a male Golden-winged parakeet who hatched in March 2007. He is a real livewire and is always in motion, usually looking for something new to get into. He loves climbing to the top of the ficus tree next to his cage, and watching the activity from that vantage point. He is an excellent eater; his favorite foods are mango and red bell pepper. His cagemate is Nelson, a White-winged parakeet. Harry lives in San Diego, CA in a household with 13 other Brotos. 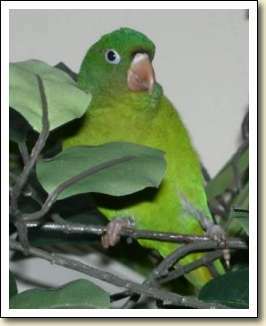 Charlie, a Canary-wing parakeet, was hatched at Shady Pines in 2004. Charlie loves toys and puzzles and gets all excited when he gets a new one (which is often!). 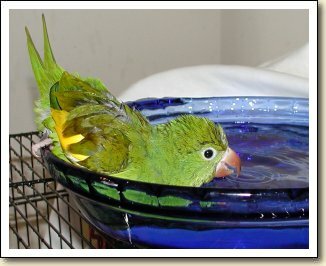 He loves taking a bath and figured out how to make water noises so I will fill his bath dish. He loves to snuggle up against my neck or snooze in the sleeve of my shirt. He prefers eating with his "flock" (me) and makes "yum" noises when something is really good. Charlie has me well-trained and is gorgeous and adorable and brilliant and smart and curious and cute and snuggly and bossy and happy and very well-loved! I feel very lucky to have him. My name is Isabella but my "Mom" calls me Bella. I flew all the way from Florida to Ohio to be with my new family. It was a long trip but I wasn't scared at all. I have a wonderful new home with lots of toys. My "Mom" eats breakfast with me every morning and then I get to play on the perch on her desk as she works on her computer. We have lots of adventures ahead of us and its gonna be fun. Bella lives with Heidi in Ohio.